The first season of SBCG4AP is over, a long time ago. What kind of ideas do you have for season two episodes? Episode title - Be Careful What you Wish For. Plot - Strong Bad finds a magic lamp and get's three wishes from the genie. He thinks for a moment and makes his wish, that Homestar Runner had never been born. The genie grants the wish and the next thing he knows, Strong Bad is sleeping on the couch. He wakes up and can't find Strong Sad, he asks Strong Mad where he is and Strong Mad asks him who that is. 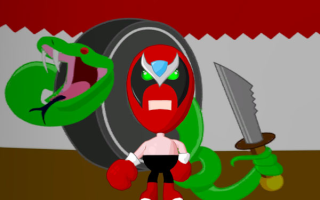 Strong Bad realizes that Strong Sad hasn't been born, too. He goes over to the track and sees Coach Z, who has a full head of hair, is actually talking street, and playing basketball with Strong Mad. He goes to Bubs and asks him if he's seen The Cheat, he asks who's The Cheat. Strong Bad keeps walking and sees that Marzipan is the mental kind of hippie now and Homsar is gone, due to Homestar never being born. The King of Town is really fun and the Poopsmith talks and is really clean and friendly. Strong Bad thinks this new world is perfect. But, he get's kinda bored of checking his emails, and everyone else is busy and can't hang out with him. Only after making an imaginary friend to insult and tell to shut up does he realize something. Homestar is what made his life interesting. He goes and finds the lamp (He still has two wishes) and wishes he never wished Homestar was never born, because he misses him. The genie tells him that all wishes are final. HOWEVER, if he finds another magic lamp he could undo the wish. The genie tells him the nearest magic lamp is on the Isle of Pom. Strong Bad has to go to the Isle of Pom and find the lamp and undo his wish. What do you guys think? :awesome: Awesome smiley. I personally have none. But there is one somebody made up called "Reign of the queen" which sounds really awesome. Strong Bad finds out that someone stole his idea for "Mount Ridesplace USA" (from sbemail theme park), and angry at the person for stealing his idea, he sets out to sabotage the theme park and figure out who's behind this. He has to sabotage the acts and rides (such as the Bowels of Trogdor and the Strong Sad gets decked repeatedly Spook Spectacular) and recruit the characters (who have all taken up jobs at the new theme park) to help him. The mini-game would be Senor Cardgage's Salesathon, a sidescroller where your goal is to attack enemies that you come across, and find customers. Find enough customers to sell your items to and make it to the next round. But don't sell your items to the enemies, and don't attack your customers, or you'll lose health. This game would be located at Senor Cardgage's "Real-Life Type Business Simulation Stand". Jigglypuff wrote: Episode title - Be Careful What you Wish For. Location : Behind You. With A Knife. A really really sharp knife.